Unexplored by many, Kazakhstan is a curious yet little-known land of vast plains, mountainous horizons and beautiful culture. Bordering Russia in Central Asia, it's truly massive in size – this is, after all, ranked as the world's ninth biggest country. It's also the most economically successful of those countries surrounding it, known fondly as the 'stans'. This is largely thanks to oil reserves, as well as other natural resources. The upshot? You can expect more modern, higher-quality hotels, restaurants and travel options compared to some of the country's poorer neighbours. South Kazakhstan is a focus of Central Asian history, featuring many famous monuments. It is a scenically diverse region where the snow-capped peaks, lakes and glaciers of the Tian Shan range give way to steppe and desert. The desert is home to the Singing Barkhan - a sand dune 3.2km (2 miles) long, which, as it crumbles, produces a peculiar singing sound. Almaty was until very recently the former capital of Kazakhstan and it enjoys a beautiful setting between mountains and plains. Still the country's biggest city, it is a hub of modern architecture, cool fountains, parks and spectacular mountain views. You can also expect irreverent nightspots, trendy cafes, and palatial malls there. 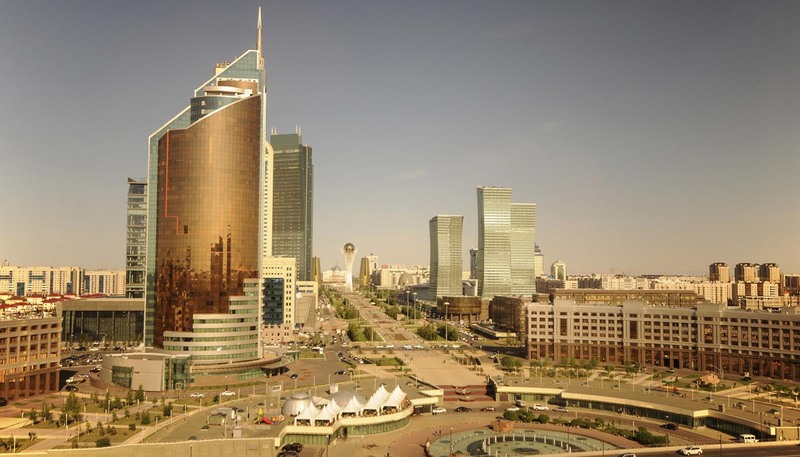 The present capital of Astana is following in its predecessor's footsteps as a modern metropolis, with its space-age buildings clinging to the northern steppe. The truth is, though, that travellers are more likely to be attracted to Kazakhstan's natural wonders. It's a beautiful country in its own haunting way, where intrepid travellers will enjoy hiking through the lofty mountains and down in the valleys of the Tian Shan. Its sparseness can seem mind-boggling, but you'll find plenty of wildlife if you look for it, especially in the lake-strewn steppe. It's also worth seeking out the underground mosques and villages that are scattered about the land. All in all, Kazakhstan is a special, unique country well worth discovering despite it being low on the radar of most tourists. 2,724,900 sq km (1,052,089 sq miles). President Kasymzhomart Tokayev since 2019. Prime Minister Askar Mamin since 2019. On 20 March 2019, the capital of Kazakhstan, Astana, was formally renamed Nur-Sultan. However, the previous name is likely to be widely used for some time. The border between Kazakhstan and Turkmenistan is currently closed to traffic. You’re advised not to try to cross the road border but to seek alternative routes, such as via Uzbekistan, until further notice. You can travel to most places in Kazakhstan, but travel to any closed area requires advance permission from the Kazakh government. Some military/restricted areas are not clearly marked. Take care when travelling away from normal routes. You can travel to Kazakhstan without a visa, provided your stay does not exceed 30 days (the day you arrive counts as day 1, regardless of arrival time). If you wish to stay longer than 30 days, you’ll need a visa. Most visits to Kazakhstan are trouble-free, but crime against foreigners does sometimes occur. You must carry your original passport at all times. Terrorist attacks in Kazakhstan can’t be ruled out. There have been a number of violent attacks and muggings on the expatriate community in Atyrau and Aktau in western Kazakhstan, and in Nur-Sultan and Almaty. Attacks have largely taken place at night, in and around local nightclubs and bars or when arriving at home late at night, as the majority of apartment buildings have dark stairwells and no lifts. Avoid walking alone and where possible pre-arrange transport. Keep valuables in a safe place and out of public view. Avoid travelling in unofficial taxis, particularly at night and alone, or if there is another passenger already in the car. You should be aware that borders, particularly with Uzbekistan and Turkmenistan, may be subject to closure without notice. From 28 March 2019, if you wish to drive in Kazakhstan you should apply for a 1968 International Driving Permit (IDP). 1949 IDPs previously issued by the UK may no longer be accepted in Kazakhstan after this date. From 1 February 2019, you can only get IDPs over the counter from 2,500 UK Post Offices. You will not be able to buy an IDP outside the UK, so get one before you travel. Local traffic police only have the right to stop vehicles if an offence has been committed, but you should obey any request from the police to stop. The police officer should complete official papers relating to any alleged offence. Many cars are not safely maintained and do not have rear seatbelts. Don’t use local buses or mini-buses as they are poorly maintained. Take care when crossing roads as pedestrian crossings are rarely respected. The International Civil Aviation Organisation has carried out an audit of the level of implementation of the critical elements of safety oversight in Kazakhstan. A list of incidents and accidents in Kazakhstan can be found on the website of the Aviation Safety network. Local airlines don’t always run to flight schedule. Check your actual departure or arrival time in advance. Keep hold of your baggage tags, as you will need to show them when you leave the airport. Terrorist attacks in Kazakhstan can’t be ruled out. Attacks could be indiscriminate, including in places visited by foreigners. Be alert to any security-related announcements by the Kazakh authorities. If in any doubt, keep in touch with the British Embassy in Nur-Sultan. Kazakhstan has a secular constitution. You should respect local traditions, customs, laws and religions at all times and be aware of your actions to ensure that they do not offend other cultures or religious beliefs. Possession and use of drugs is illegal; if found guilty, you could face a lengthy prison sentence in basic conditions. Although homosexuality is not illegal, it is often not tolerated, especially outside the major cities. See our information and advice page for the LGBT community before you travel. You must carry your passport at all times (not a photocopy). There are restrictions on photography near military establishments, border areas and some official buildings. Notices about these restrictions are not always indicated. Photographing airport facilities is prohibited. Many of the larger shops and supermarkets also prohibit photography. You can import a drone into Kazakhstan at airports or land border crossings without a licence. However, unlicensed use of drones in Kazakhstan will attract a fine, detention and confiscation of equipment. You can get a licence to use a drone from the Aviation Committee in Nur-Sultan. Applications for licences should include technical characteristics of the drone and details of planned use (when, where, how long). You can find more information about licensing requirements on the Zakon.kz website (information portal of the Republic of Kazakhstan) (only in Russian). You can travel to Kazakhstan without a visa, provided your stay does not exceed 30 days (the day you arrive counts as day 1, regardless of arrival time). If you wish to stay longer than 30 days, you’ll need a visa. You should contact your nearest Embassy of Kazakhstan for further information. Make sure you have the right visa for the purpose of your travel, especially for business visas or work permits. Check the validity dates of your visa and any associated restrictions carefully before you travel. Don’t cross the border into or out of Kazakhstan illegally. For most visits, British passport holders don’t need to register with the local authorities providing you arrive at one of the 12 international airports. Check with local oblast authorities as some oblasts still insist on the registration requirement for visitors even for short stays. If you don’t need to register with the local OVIR office (the Department for Visas and Registration under the Ministry of Internal Affairs), you must keep your white immigration card stamped by Kazakh Immigration throughout your journey and present it on departure. If you intend to enter through a land or sea border point check with the Kazakhstan Embassy to see whether registration is required. For visits of more than 90 days you will need to register with the local authorities OVIR. Your travel company or employer may do this for you. Your passport should be valid for a minimum period of 6 months from the date of your request for a visa. Your passport should also have at least 1 blank page for your visa. UK Emergency Travel Documents (ETDs) are accepted for entry (with a valid Kazakh visa), airside transit and exit from Kazakhstan. If using an ETD to leave Kazakhstan, you must get an exit visa from OVIR (the Department for Visas and Registration under the Ministry of Internal Affairs). This process can take 5 working days or longer. Dual nationality isn’t recognised in Kazakhstan. If you enter Kazakhstan on a Kazakh passport and also hold British nationality the British Embassy can only provide very limited consular assistance. In cases of arrest or detention, consular access is unlikely to be granted. The government of Kazakhstan imposes limits on how much foreign currency can be imported or exported, and certain goods are subject to custom regulations. For further information please visit the website of the Ministry of Foreign Affairs of the Republic of Kazakhstan. The reciprocal healthcare agreement between the UK and Kazakhstan terminated on 1 January 2016. The medical facilities in Kazakhstan are not as advanced as those in the UK. Make sure you have adequate travel health insurance and accessible funds to cover the cost of any medical treatment abroad, evacuation by air ambulance and repatriation. There are regular outbreaks of haemorrhagic fever (a tick-borne disease) in southern Kazakhstan in spring and summer, which have caused deaths. There are ongoing reports of lead pollution in the southern city of Shymkent and immediately surrounding areas. If you need emergency medical assistance during your trip, dial 103 and ask for an ambulance, although the emergency services operators only speak Kazakh or Russian and waiting times for ambulances can be lengthy. If possible it is often quicker to take a taxi to the hospital. You should contact your insurance/medical assistance company promptly if you are referred to a medical facility for treatment. Almaty is in an active seismic zone, but the last major earthquake involving loss of life was in 1927. The US Federal Emergency Management Agency has advice about what to do before, during and after an earthquake.